General Dynamics Ordnance and Tactical Systems – Canada offers a full range of 105mm artillery ammunition for the 105mm Howitzers, including high-explosive, illuminating and blank rounds. Our HE fillings, which consist of TNT or Composition B, produced in our melt and pour facility meet all critical safety factors. The 105mm High Explosive (HE) M1 cartridge is semi-fixed that can be fired from most existing 105 mm artillery howitzers. Its M67 propelling charge is made of seven increments that can be combined to achieve various ranges. The projectile, filled either with 2.1 kg of TNT or Composition B, can be fitted with a wide variety of NATO standard fuzes. Upon impact on the ground or proximity to a target, the projectile detonates to yield blast and fragmentation effects. 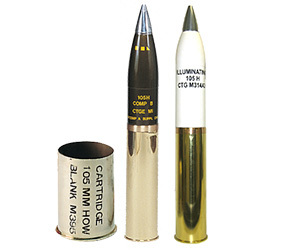 The 105 mm Illuminating Cartridge M314A3 is a semi-fixed artillery ammunition that uses the M67 propelling charge system with a M14 cartridge case. The projectile body is made of a thin-walled hollow steel forging with a boat-tail base. The payload is composed of a canister filled with approximately 800 grams of pressed illuminating compound with a slow descent rate achieved through a parachute. The cartridge can be fired from most existing 105 mm howitzers. Average Illuminating Intensity: 500,000 candelas for minimum of 60 s.
The 105mm Blank M395 cartridge is used for salutes or simulating battlefield noise. It consists of a shortened M14 cartridge case filled with approximately 700 grains of black powder closed with a wad glued into place with epoxy resin. The base of the case is fitted with an M61 percussion element and an M1A2 primer. Ignition of the cartridge creates sound, flash and smoke. Left: Members of the 38 Artillery Tactical Group fire the C3 105-mm Howitzer during an exercise. Right: Reservists work together to load ammunition into the Howitzer 105 gun.